Yesterday, I had the once in a life time opportunity to attend an event held for one of the greatest contributors to peace in the world; Archbishop Desmond Tutu. The event was held to confer the title of Honorary Fellow in conjunction with the introduction of the Archbishop Desmon Tutu/Henley Management College Scholarship Programme for Ethical Leadership. 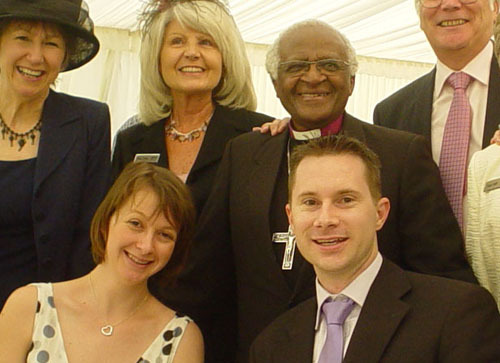 Things started off with all the guests enjoying a Pimms and Lemonade (terribly English) in the Riverside Restuarant whilst Desmond Tutu and the other VIP guests planted a tree in a quad in the college and held a press conference. Things took a little longer than planned, but we were soon invited to enter the marquee in preparation for the procession by the members of faculty, VIP guests and the principal. The procession took place, with the members of the faculty leading, followed by the academic registrar and then the VIP guests - two of the three current Honorary Fellows, Sir John Read KBE, Professor Meredith Belbin, Sir Sydney Kentridge (represented Steve Biko's family in the inquest into his death) and Desmond Tutu himself. Once everyone was in place and seated, the Principal welcomed all the guests with a short speech. Apparently he met Desmond Tutu as a boy when Desmond Tutu visited his school. He then invited Sir Sydney Kentridge to address the guests. This was a lovely light hearted speech about Desmond Tutu and his contributions to South Africa. The conferment of Honorary Fellowship then took place after which Desmond Tutu then addressed the guests. I don't know exaclty what the conferment entailed as I was way too far back to see, but there was a lot of hand shaking and Desmond Tutu looked like he just wanted to do away with the formalities and give someone a great big hug. Maybe that's just my perception. After Desmond Tutu's speech, the "Platform Party" (the peeps on the stage) then proceeded to leave the marquee and lunch was served. Very posh nosh too. The starter was a fancy seafood stack, main meal was a very large cutlet (a slab is probably a bit more accurate) of roast lamb with vegetables and desert was an assortment of orange ice-cream, rich chocolate mousse and a tiny rhubarb crumble. One thing that was very nice was Desmond Tutu took the time out to walk over to each and every table and thank the guests to attending. He even stopped for pictures and the odd chat here and there. Oh, and I think I'm very honoured - when he came to our table, he stood just behind me, between Claire and I and rested his hand on my shoulder. The whole day was then wound up with a toast and reply during the dessert course. One thing is for sure, the place was teaming with South Africans - not only did we have Desmond Tutu and Sir Sydney Kentridge, but also Ms Lindiwe Mabuza (South African High Commissioner in London), me and several of the Henley staff working were also South African. It was also nice to hear South Africa being mentioned so much, and it just sounded right when Sir Sydney Kentridge said those two words. I know this is an odd thing to say, but since I've lived in the UK, I've always thought that it sounds odd when the English say South Africa. Oh, and if you're ever wondering the streets of London or the UK and you spot a Jaguar with the number plate "1 RSA" - you can be safe in knowing that's the South African High Commissioner's car. All in all, it was a very enjoyable day. I've placed all the photos I took in my Gallery for all to see.